Last weekend I met my boyfriend's family for the first time. They invited me round to dinner on Jewish New Year. As if that wasn't scary enough, I was also set the task of baking the honey cake. This was, of course, my cue to completely freak out. I am a very irrational person. So when I pulled out all my cookbooks and found no honey cake recipes and found absolutely no consistency between recipes online, I decided the best solution was to make up my own recipe. Surprisingly, it actually went quite well. It's traditional at Rosh Hashanah to dip apple slices into honey, so I wanted to include apple in the cake. To do this I followed part a recipe I made a while ago (see here for the honey apple and almond kugelhopf), cooking apples in rum, honey and butter. I then drizzled the liquid over the cake to keep it moist as I'd read dryness is a common problem with honey cake. The bees are made of marzipan. I had to make them because I saw a beehive cake on the internet and went crazy for a while and thought I should make a beehive cake. Then I came to my senses and compromised by making marzipan bees. This recipe will serve 12. 1. Preheat the oven to 170C. Add all the ingredients for the honeyed apples save for the apples and almonds to a large frying pan and bring to the boil. Add the apples and reduce the heat to produce a gentle simmer. Cook for 8-10 minutes, turning the apples often until they have softened and the liquid thickened a little. 2. Drain the liquid off the apples and set aside. Beat together the sugar and butter for the cake. 3. Beat in the honey. Beat in the eggs, adding two tbsp of sifted flour with each egg to stop the mixture from curdling. 4. Fold in the honeyed apples. Fold in the flour and baking powder. 5. Spoon the cake batter into the tin and bake for 10 minutes before sprinkling over the flaked almonds and covering the cake with foil to stop it from browning too much. Bake for another 20-30 minutes until a skewer inserted into the middle of the cake comes out clean. 6. While the cake is in the oven, roll the marzipan into 12 equal sized ovoid shapes. 7. Break the dark chocolate up in a bowl and heat it in the microwave for 30 second bursts, stirring in between, until melted. Spoon it into the piping bag and cut off the tip to leave a very small opening. Pipe chocolate across the marzipan balls in two stripes and then, without squeezing, just touch the tip of the piping bag gently against the marzipan to do the eyes and stings of the bees. 8. While the chocolate is still wet, carefully place two almond flakes on the back of each bee. 9. Remove the cake from the oven and pierce several times with a cocktail stick. Place on a wire rack to cool with something underneath to catch the drips. 10. Brush all over with the liquid from the honeyed apples. Depending on how long the liquid has been cooling, the butter may solidify on top. If this happens, just give it 30 seconds in the microwave and stir well. Brush the liquid onto the cake a couple more times after 10 minute intervals. If you like, reserve the rest of the liquid to use as a sauce. Put the bees on and around the cake and serve. 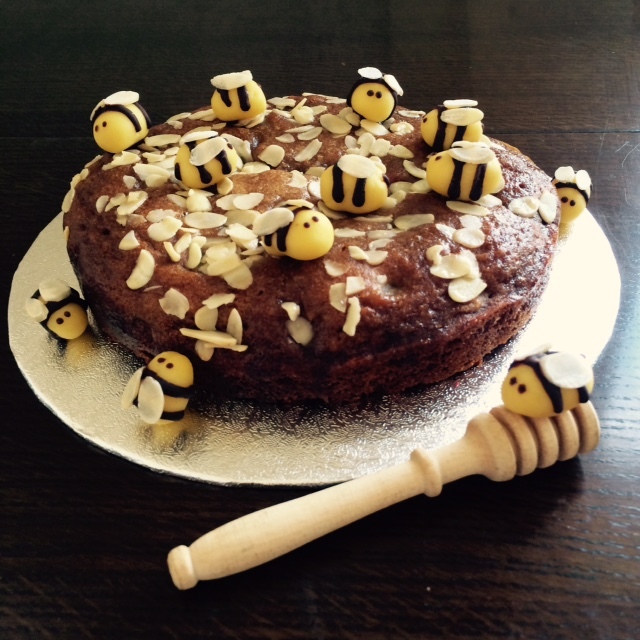 I'd glad to say the boyfriend's family liked the cake, especially his grandfather, who ate quite a few of the bees.